You're here. The boxes are unpacked (maybe). The first credit card bill or package has arrived at your new doorstep. Your thumbs are sore from pushing endless tacks into the walls and mounting your favorite pictures. Now it's time to get out and explore your adopted surroundings. Here, we’ll cover three essential steps to casing your hood and how you’ll adapt to the area as a pedestrian. Since you’ll seldom have the convenience of hopping into a car at a moment’s notice and roaring out of the driveway, you should begin your neighborhood orientation by figuring what sort of transit options are available within one square mile of your residence. (The average person takes about 20 minutes to walk one mile at a normal pace.) To determine that square mile “circle,” I recommend paying a visit to this website, which will allow you create a circular square mile perimeter around a location of your choice. See my example below. Once you’ve drawn your circle, the next step is determining what exists within the circle. Is there a Metro rail station? If not, how far is the closest one? What bus lines have stops within the circle? Google Maps and Google Transit will allow you to find these options with just a few clicks. If you plan on using rideshare services like Uber and Lyft, try loading the app(s) and gauging the availability of drivers within your area, during both daytime and nighttime hours. Knowing your local transit options will help you plan your weekly “rounds” as a pedestrian. Whether you’re heading to work or traveling to another neighborhood to try some just-opened craft brewery or to toss a football around a beach, commuting to most LA locales without a car can absolutely be done. It’s mostly a matter of time management and defining what’s reasonable to you: as in, how much time and money are you willing to spend on commuting? 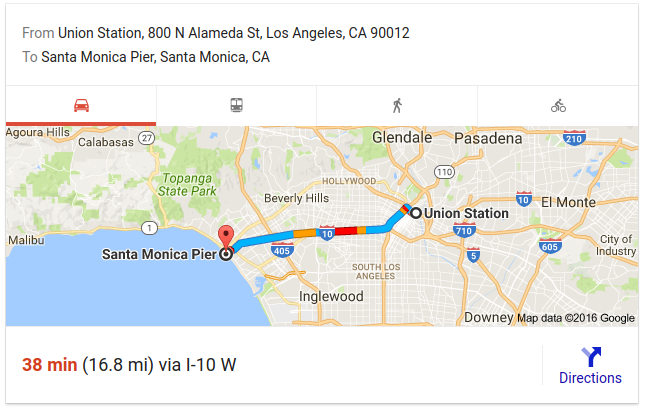 If we pick a point on the east side of LA - say, Union Station - and trace a line west to the Santa Monica Pier, most transit options - including cars - will make that journey anywhere between 35 minutes and an hour and a half. This is the window of commuting time you’ll be looking at for most routes in the immediate LA area. The advantage you have, as a pedestrian is being able to decide what’s more important to you: frugality or efficiency. The cheapest way to commute is to strictly stick to the bus and Metro rail, even if this means walking 10-20 minutes from a station to your destination, or sitting in traffic on a busy street while your bus creeps along and makes frequent stops. All-inclusive Metro/bus passes cost $25 per week and $100 per month. An Uber ride will cost you at least $10 in most cases, and they add up fast. On the other hand, if you’ve got the luxury of a big budget, you can maximize your time savings by taking the Metro rail whenever possible (to avoid traffic) and using rideshare services to fill in the gaps. While you’ll still be subject to traffic, just as you would be riding a bus, you can spare yourself the frustration of having to wait for a bus to show up. And during the peak traffic hours in LA, those bus wait times can balloon considerably. Of course, planning how to get around paper can only get you so far. To truly familiarize yourself with the pedestrian offerings of your neighborhood and how to utilize them, you’ll have to get out there and go for some walks and rides. This will allow you to calculate the average time it takes to reach various destinations and identify obstacles that can slow you down. What you’re looking at here is the closest bus stop to my house. This photo was taken less than one minute away from my front door. However, even though it’s right there, reaching that bus stop will take me closer to five minutes. Why? Because jaywalking is very dangerous on LA’s busiest streets, and this particular street, Normandie Street, is usually full of speeding vehicles. The nearest crosswalk is three blocks away, and thus, to schedule my commute efficiently, I have to plan on walking those three blocks, twice. That’s just one example of an obstacle that you can only detect by going a trial run. A more common issue you’ll run into is traffic on major streets at certain times of the day. One of the closest major streets to my house, Vermont Avenue, becomes an immobile crush of cars between the hours of 5:00 PM and 7:30 PM. If I’m taking a bus up Vermont toward Los Feliz to catch a movie at 7:15 PM on a Friday night, I’ll need to leave my house by 6:00 PM to avoid missing the showtime. This is something I’ve learned from bad experiences. Google Transit, while capable of taking traffic into account, often underestimates how interminable LA traffic can be and thus, provides an unreliable commute time projection. Got the picture? If so, I’ll see you on the 754 Rapid.